JoAnn Cordes holds a photo of her son, William, for whom she made this quilt that pays tribute to his 22 years and two months of military service. Each year on Nov. 11, individuals and organizations honor U.S. military veterans on Veterans Day. The tributes take on many forms. The following story high-lights just one example. Twelve t-shirts fashioned into a quilt tell the story of a 22-year military career that included stints in Bahrain, Kosovo and South Korea. JoAnn Cordes displayed her handi-work at the Madison County Senior Center during a Nov. 9 Veterans Day ceremony. 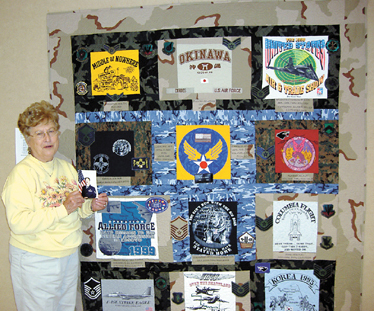 She will give the quilt to her son, retired U.S Air Force Master Sergeant William N. Cordes, in early December. JoAnn lives at Choctaw Lake with her husband, Bob. Both are active members of the Senior Center. JoAnn quilts at the center every Tuesday with a group of like-minded women. She started the military t-shirt quilt last year while visiting William in southern Georgia, where he lives with his wife, Jayne. William does in civilian life what he did as a military man—liquid fuels maintenance for military jets. His place of employment is Moody Air Force Base outside of Hahira, Ga.
During their visit last year, JoAnn and William decided jointly the order the t-shirts would appear in the quilt. Since then, JoAnn has put in "hours and hours and hours" on the project. Her first order of business was cutting out the t-shirt designs and other memorabilia, including an emblem from one of William’s hats, to incorporate into the quilt. Then she started the appliqué work. "I had to use a needle that you use for leather," JoAnn said, regarding the tools needed to stitch the thick materials together. For the quilt’s backing and the sashing around the shirt blocks, JoAnn selected three different colors of camouflage fabric. "Under each block, I have written the name of the base and the country he was in," she said. 1. "Middle of Nowhere," Bergstrom Air Force Base, Austin Texas. The main graphic is a donkey. 2. "Okinawa," Kadena Air Force Base. The graphic is a red circle symbolizing "the rising sun" of Japan. 3. "1990 U.S. Air and Trade Show," Wright-Patterson Air Force Base, Dayton, Ohio. The main graphic is a stealth fighter. 4. "Enduring Freedom," Cannon Air Force Base in New Mexico, from which William went to the island of Bahrain in the Persian Gulf to fuel jet fighters for bombing runs over Afghanistan. 5. "Liquid Fuels Maintenance School," Chanute Air Force Base, Illinois. The main graphic is the Air Force wings. This is the quilt’s center square. 6. "Red Devils," Kunsan Air Base, South Korea. One of the graphics is a devil holding a pitchfork. 7. "Operation Allied Force in Kosovo," Rhein-Main Air Force Base, Germany. A plane and a map are featured. 8. "If You Can’t Run with the Big Dogs, You Should Have Stayed Home," Operation Enduring Freedom, Bahrain. The main graphic is a dog. 9. "Columbia Flight," Pope Air Force Base, North Carolina. A shuttle is pictured. 10. "F-15E Strike Eagle," Lakenheath, England. William fueled F-15E planes. 11. "Wings Over the Heartland," Altus Air Force Base, Oklahoma. 12. "Korea 1995: A Free Weekend," Kunsan Air Base, South Korea. "He hasn’t seen the quilt yet. He doesn’t know it’s done," said JoAnn, who will give William the quilt during an early Christmas get-together in London. William Cordes grew up in Findlay, Ohio. He entered the Air Force in November 1980 after graduating from high school. He retired from the military on Jan. 1, 2003.